John Clulow has attained the master’s chair for a second time, previously having served as the master of Olympia Lodge No 6812 some 18 years earlier, and now as the WM of Jubilee Lodge No 5555. The visitors were treated to a first-class ceremony that was delivered in a warm and welcoming manner by Huw Jones and his team. David Winder congratulates John Clulow (right) on his return to the master’s chair. The principal guest of the evening was Assistant Provincial Grand Master David Winder, accompanied by grand officers Stan Rigby and the Preston Group Vice Chairman Geoff Saul. They were supported by acting Provincial grand officers Terry McGill and Andy Sumner. After welcoming the visitors, the master of the lodge Huw Jones, opened the lodge in due form to carry out the administrative business. On completion, the lodge director of ceremonies John Stansfield requested permission to retire for a short time and whilst during his absence, the lodge was raised to the third degree. He returned to announce the presence of Assistant Provincial Grand Master David Winder. David duly entered, accompanied by grand and acting Provincial grand officers, to be formally welcomed by Huw. Following the usual salutations, the lodge returned to the second degree, when Huw had the pleasure of thanking the officers and brethren of the lodge for their support during his year in office. After resuming to the third degree, a board of installed masters was declared, with John being installed in the chair of the lodge in a first-class ceremony conducted by Huw. The working tools of the third degree were presented by Huw, those of the second degree by Stephen Read and those of the first degree by John Stansfield, all of whom gave first class presentations. Now as master of the lodge, John was addressed in a flawless manner by Frank Cameron who repeated the high standard set by the working tools team. The ceremony continued with John appointing his officers for the coming year. As senior warden he appointed Frank Cameron, informing him of his duties. As junior warden he appointed Stephen Read, also informing him of his duties. The address to both wardens was given, again in an excellent manner, by Geoff Brown. The WM continued to invest all his officers concluding with Rick Whelan, who is to be invested as tyler at a later date. As the offices were filled by brethren who had held them before, with the exception of the invested charity steward Frank Cameron, they were not addressed as to their duties. Vic Parker in his role as the Preston Group Charity Steward, had the pleasure of addressing Frank and explaining the current duties of his office. Bringing the ceremony to a close, the brethren of the lodge were addressed by the principal guest David Winder. David then brought greetings and congratulations on behalf of the Provincial Grand Master Tony Harrison, commenting that had he been present, Tony would have been pleased to see John returning once more to the master’s chair in what had been a delightful ceremony. He congratulated all the brethren of the lodge, led by Huw as the installing master, who had participated in the day’s proceedings and made the ceremony so pleasing. John Clulow (right) receiving an MCF 2021 Festival Patron’s certificate from David Winder. 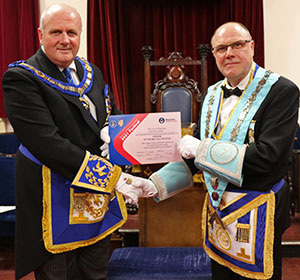 After congratulating John on his return to the master’s chair, David had the pleasure of presenting the lodge with a MCF 2021 Festival Patron’s certificate marking their contribution to the Festival of a sum now exceeding £3,000. He thanked the lodge for their magnificent beneficence and went on to inform the members that each year, the Province of West Lancashire receives £1,000,000 from the grand charities in support of those who are in need of care. In accepting the certificate on behalf of the lodge, John thanked David for his kind comments and presented him with three cheques, the first for the sum of £1,500 giving further support to the MCF 2021 Festival. The second for £250, in support of the West Lancashire Freemasons’ Charity and the third, for £250 in support of Preston Masonic Hall. David thanked the lodge brethren for their further laudable generosity saying, the lodge may not be huge in numbers, but its generosity was enormous. The meeting concluded with Joe Collier presenting Huw with a past master’s jewel and thanking him for all the support he given to the lodge, not only during his year as master, but over the preceding years. His attendance record at regular meetings, committee meetings and lodge practices bore no equal as, living on the island of Anglesey, his journey from home to the Masonic hall involves a round trip of some 300 miles. Huw did admit that, although his car is only three years old, it had already covered over 103,000 miles. Later in the evening, in response to the toast to the grand officers, David started with a little humour intimating that the lodge was consecrated in 1935, the year in which Elvis Presley was born. It also happened to be the same year that ‘Alcoholics Anonymous’ was founded, however he said this was no reflection on the members of Jubilee Lodge. He continued in a similar vein, eliciting many groans from the brethren before saying that he was always pleased to visit such a happy and friendly lodge as Jubilee Lodge. He was pleased to have the company of fellow grand officers Stan Rigby and the group vice chairman Geoff Saul and went on to thank acting officers, Terry McGill and Andy Sumner for their support. David congratulated his long-time friend John, on his accession to the master’s chair once more. Much to the amusement of those present, he continued the humorous theme with many oblique, possibly shocking, references to John’s working background in electrical engineering. Pictured left: Kevin Ruffley (left) toasts John’s health following the master’s song. Pictured right: John (right) presents David with a bouquet of flowers for his wife Sue. Turning to Huw as the installing master, David congratulated him on his excellent work in the lodge earlier and thanked him for all he had done for the lodge over the past 20 years as a member of Jubilee Lodge. With Huw making so many journeys between Anglesey and Preston, David felt the rumour, that there was a now a permanent groove in the road, was possibly true. 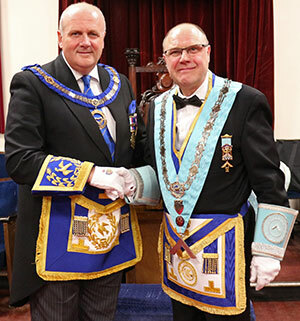 Moving on, David said he was delighted to see so many brethren wearing the new Provincial tie and that the lodge had become a Patron of the MCF 2021 Festival. For those who had yet to consider making a pledge for a Festival Jewel in support of the MCF 2021 Festival, he urged them to consider doing so. For information he added that the cost currently works out at 22 pence per day over the remaining Festival period. He continued by thanking those that were using the white envelope scheme, reminding those who were tax payers, that an extra 25% can be added to the donation courtesy of the government at no further cost to themselves. In terms of giving, on his own behalf he thanked the lodge for the further generous donations made earlier in the lodge, repeating his earlier praise that they represented a magnificent sum indeed. David went on to remind the brethren about the recent UGLE article, ‘Enough is Enough’, produced in response to recent newspaper articles denigrating Freemasonry. He urged the brethren to be open and proud of their membership of Freemasonry. He concluded his response by thanking the lodge secretary Vic Parker for the information provided prior to the meeting and the lodge DC John Stansfield, for his excellent use of Masonic ritual. The evening’s proceedings were further enhanced by a delightful rendition of the master’s song given by Kevin Ruffley accompanied by Howard Linaker on the piano. At the conclusion of the evening, John rose to thank David for his attendance that had been greatly appreciated and on behalf of the lodge members, he presented him with a bouquet of flowers for his wife Sue. He hoped they would act as some form of recompense for her being without David’s company for another evening. Pictured from left to right, are: Andy Sumner, Terry McGill, David Winder, John Clulow, Huw Jones, Vic Parker, Geoff Saul and Stan Rigby.